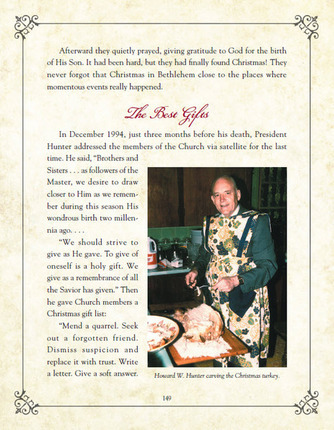 In this Christmas keepsake, illustrated throughout with historical photographs, paintings, and drawings, each story of a Christmas past is a testimony of the Messiah, borne by one of His special witnesses. "The Keys Are Right Here"
"Every Latter-day Saint in All the World"
"No Thought of Home, Hardly"
"What Does Turkey Taste Like?" Laura Fayone Willes, a Salt Lake City native, holds a degree in American Studies from the University of Minnesota. She has published two previous books, Minnesota Mormons and Community of Faith. Laura has been an early-morning seminary teacher, Gospel Doctrine teacher, and stake Relief Society president, and she served a full-time mission with her husband, Mark, as he presided over the Hawaii Honolulu Mission. She and her husband are the parents of five children and live in Utah. Using recurrent themes of work, family & service we can read about the Prophets Christmas traditions of the times in an often tender and poignant way. Some stories are humorous while others leave us contrite...yet each story leaves us with a personal testimony of Christs divinity and the true Spirit of Christmas. This book will quickly become a keepsake! We have really enjoyed reading about each prophet. There is a strong spirit this time of year that allows us to feel tender-hearted. I feel like I have gotten to know each prophet on a personal level...seeing many of them for the first time as children. This would make a wonderful Christmas Gift! This book is absolutely gorgeous--a perfect gift book. The pages are thick, glossy, and filled with beautiful photographs. I love how Laura F. Willes built the format for this book. It studies each prophet of our church giving details on their life including Christmas traditions, childhood Christmas memories, favorite Christmases they celebrated, and a message from each prophet. As you read the book, you'll be filled with the true spirit of Christmas, love for our Savior, and a desire to emulate these fine men who enjoyed celebrating this wonderful Christmas season. I've read this book several times--it's my holiday favorite. We read a story each night in December (after scriptures and prayers) leading up to Christmas Eve. My favorite story is about Joseph Smith dressing up as Santa Claus and delivering popcorn balls and candy canes to the kids in Nauvoo. Then afterwards, he joined the other saints for a barn dance at Heber C. Kimball's place, followed by a stick pull contest. This book has been a huge hit in our home. The author found wonderful stories that make the prophets of the Latter-Days real to my and my children. So glad we found this book. This book is simply beautiful. Beautiful illustrations; beautiful stories; and a beautiful message. These stories are great to share with family of all ages. Perfect gift! I was surprised by how good this book was. 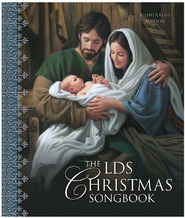 It has the most wonderful Christmas stories about how each of the Latter-day prophets celebrated Christmas. This is perfect for our family tradition of reading Christmas stories to the kids each night leading up to Christmas! This wonderfully written and heartwarming collection of Christmas vignettes by all sixteen of Our beloved Prophets is a must for every Latter-day Saint library. Each chapter is devoted to little vignettes in each prophet's life during Christmas. Joseph Smith's Christmas of 1838 was being incarcerated in Liberty Jail that had a ceiling so low, the few men couldn't even stand. 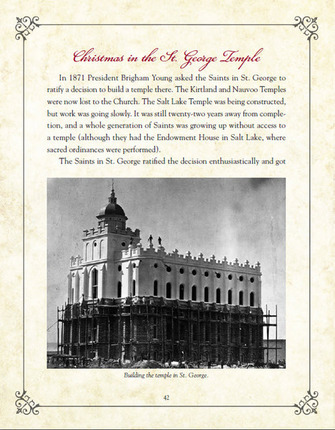 Brigham Young doing Temple Ordinances all day on Christmas 1845, shows how much he cared for his people. John Taylor spent a Christmas hiding with members and one mother made him a pair of socks. Wilford Woodruff spent Christmas Day 1836 in the Kirtland Temple, which was common in those early days. Lorenzo Snow staged a play in his small log cabin on Christmas Day while in Mt. Pisgah in 1846. Joseph F. Smith, son of Hyrum Smith, felt so bad one Christmas because he couldn't afford even a dollar for his family, sobbed, then realized that his love for his family is the best Christmas gift he could give. Heber J.Grant, a man after my heart, loved to give books as Christmas gifts. George Albert Smith learned whenhe was quite ill how very important tithing was, so that Christmas became a "Tithing Christmas." 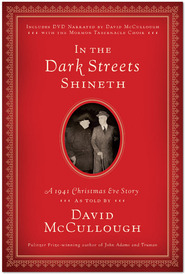 David O. McKay spent one Christmas talking to some Japanese members, esp children, who sang "Jesus Wants Me For A Sunbeam." Joseph Fielding Smith's fond Christmas was when one of hisd daughters, fearful of being caught coming down the stairs to see what Santa had left, hid underneath a table in the den while he kept reading. Harold B. Lee spotted a young boy walking in the snow without much in the way of clothes and helped this boy's family to have a good Christmas. Spencer W. Kimball started giving fifty dollars to a special member in need. Ezra Taft Benson loved to go into the canyon to cut their family tree and he had to find one that would reach the ceiling. Howard W. Hunter spent one Christmas as a boy going "Hookeybobbing" with his sister, fixing a sail to his "pushmobile." Gordon B. Hinckley made a make-shift chimney out of wood, as they didn't have a fireplace when he was growing up. Pres. Thomas S. Monson has always remembered the widows during the Christmas season, and started visiting each one in his ward when he was bishop. At the end of each vignette, each prophet leaves a special message to stay close to the Savior, as He is the Reason For the Season. I absolutely love the cover of this special book on our beloved prophets. I received this review copy from Deseret Books. The book is filled with stories that inspire, teach, and remind us of the joys of a simple life. I enjoyed the account of his pulling children and grandchildren on a yearly sleigh ride through Huntsville. It is accompanied by a photograph of President McKay standing in the wagon, dressed in his long raccoon coat, and the sleds behind. This is a book has wonderful illustrations, thick glossy pages, testimonies, and a framed picture of each prophet. But it is the messages that make it a treasure.